Uruguayan president-elect José “Pepe” Mujica is trying to intervene in a conflict that started more than seven years ago, and which still makes headlines in Uruguayan and Argentinean Media. Since the opening of Finnish pulp mill Botnia in Fray Bentos (Uruguay) along the Uruguay River—a natural border between Argentina and Uruguay—environmentalists and locals from the area and its neighboring Argentinean city Gualeguaychú have been protesting against alleged environmental and health hazards caused by the mill. Botnia Pulp Mill. Picture taken by Flickr user Gonzak and used under a Creative Commons license. A beautiful city with very nice people, it is worth seeing if one has the chance: it has hot springs, places to camp, and beaches along the Gualeguaychú river. However, even though the most attractive things are the natural resources of the zone, the constant exposure of signs on homes, commercial establishments and even on cars opposing the environmental threat which the installation of pulp mills and Botnia in particular within Uruguay, is striking. 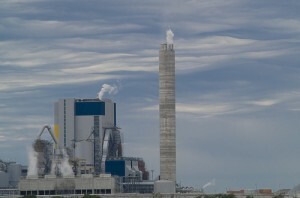 Skepticism about the plant posing an actual environmental or health hazard opposes the claims made by environmentalists, as various organizations have denied that the mill contaminates the air. According to local news organization from Entre Rios, Agencia de Noticias de Entre Rios APFD [es] , Marisa Arienza from Green Cross reported that the there have not been any changes in the levels of sulfur dioxide in the air since the plant began operations. Still, the strongest and most established protest came from the “piqueteros” who are discontent with the pulp mill and have used protest tactics like the takeover and blockade of bridges that act as important passage ways between the two countries for tourism and commercial purposes. 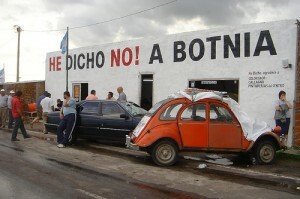 ‘I Said No!’ Blockade from Fray Bentos, Uruguay and anti-Botnia slogans. Picture taken by Flickr user sebaperez and used under a Creative Commons license. Melnik also said that environmentalist will have to defend the blockade even harder, now that Mujica has tried to mediate. Shortly after taking office, Mujica will have to face the verdict from the International Court of Justice at The Hague, where Argentina issued a formal case against Uruguay in 2006. Mujica’s close relationship with Kirchner and his recent attempt to reach out to governor Urrubarru will also be tested when he becomes the official president. Mujica has said he will not negotiate with “piqueteros,” and the “piqueteros” in turn, say they will not take action until the Hague pronounces its verdict. 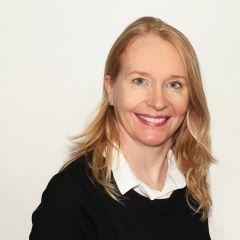 I’m a German, living in Uruguay since a couple of years. All this is a big shame – a shame for the politicians of Argentina, particularly for the Kirchners, a shame for the mercosur, which shows one time more that Uruguay, although a member of this union, isn’t worth – to small, to uninteresting, a shame, not at least, also for the helpless uruguayan politicians. But first of all – a shame to the argentine “piqueteros”. 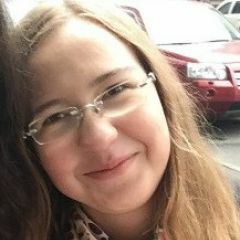 They are obviously not ashamed to block one of the most important economical veins of Uruguay for years, but what really really show me the deep stupidity of them is, that they are not ashamed to compare a paper-mill with the horror of Ausschwitz – for me as a German, that’s really a malice! Shame on you!